There are many software packages that provide methods for analyzing patterns observed in remote sensed image files and raster grids. Some of these focus on the process of classifying pixels or grid cells, in order to identify land-use and vegetation cover. A second and often related procedure is that of describing and analyzing the observed patterns. 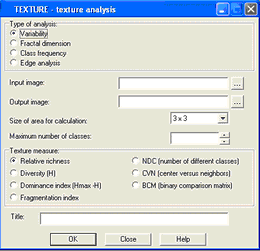 For example, it has been found that the quality of classification of forested regions can be considerably improved through the use of texture analysis (Zhang et al., 2004), which may utilize measures of the kind described below or a range of other forms of surface variability analysis. As we have seen in the preceding subsections, descriptive statistics may be simple summaries of the frequencies of particular classification values or categories, which are non-spatial attributes of the dataset, or they may provide spatial measures or landscape metrics. A substantial number of such metrics have been devised over the last 50 years, principally in the field of landscape ecology, and a number of software packages and toolkits developed to undertake such analysis. The most well-known package, Fragstats, provides much of the background for other packages, such as Fragstats for ArcView, Patch Analyst (which provides both vector and raster-based patch analysis). Pattern analysis facilities of this kind are also to be found in SAGA, SAM and PASSaGE. The TEXTURE set of image transform operators in Idrisi supports several such measures, and we start by using this facility to clarify the operation of some of these metrics. TEXTURE actually supports four separate sets of image texture analysis: variability; fractal analysis; class frequency; and edge analysis. These analyses are typically performed on integer-valued image files only. Figure 5‑16 illustrates the range of measures provided for the first of the categories, variability. The input is a single image file and the output is again an image file, this time with each pixel representing the computed (i.e. transformed) value computed from the input image. Note that a kernel of pixels is used for each calculation, in this case selectable from 3x3, 5x5 or 7x7 pixel blocks. These operations are essentially pre-defined map algebra focal operations, as described in Section 4.6, Grid Operations and Map Algebra. The second category of texture analysis functions, fractal dimension analysis takes a single input image provides the source data and the output is a generated fractal dimension image based on estimated pixel dimension values using a 3x3 kernel. The fractal dimension is itself computed using the estimated slope (or reflectance value equivalent if a remotely-sensed image) over the kernel (see also, Section 6.7.1, Core concepts in Geostatistics). Below, we provide summary details of both the non-spatial and spatial metrics based on an edited version of the Fragstats documentation (with their kind permission). As noted above, these metrics cover a wide range of measures, many of which are closely correlated, and only a subset of which are implemented in widely available software packages. The common usage of the term “landscape metrics” refers exclusively to indices developed for categorical map patterns. Landscape metrics are algorithms that quantify specific spatial characteristics of patches, classes of patches, or entire landscape mosaics. A plethora of metrics has been developed to quantify categorical map patterns. These metrics fall into two general categories: those that quantify the composition of the map without reference to spatial attributes, and those that quantify the spatial configuration of the map, requiring spatial information for their calculation (McGarigal and Marks 1995, Gustafson 1998). Although a large part of landscape pattern analysis deals with the identification of scale and intensity of pattern, landscape metrics focus on the characterization of the geometric and spatial properties of categorical map patterns represented at a particular scale (grain and extent). Thus, while it is important to recognize the variety of types of landscape patterns and goals of landscape pattern analysis, Fragstats focuses on landscape metrics as they are applied in landscape ecology… Landscape is not necessarily defined by its size; rather, it is defined by an interacting mosaic of patches relevant to the phenomenon under consideration (at any scale). P: Patch-level metrics are defined for individual patches, and characterize the spatial character and context of patches. In most applications, patch metrics serve primarily as the computational basis for several of the landscape metrics, for example by averaging patch attributes across all patches in the class or landscape; the computed values for each individual patch may have little interpretive value. C: Class-level metrics are integrated over all the patches of a given type (class). These may be integrated by simple averaging, or through some sort of weighted-averaging scheme to bias the estimate to reflect the greater contribution of large patches to the overall index. There are additional aggregate properties at the class level that result from the unique configuration of patches across the landscape. L: Landscape-level metrics are integrated over all patch types or classes over the full extent of the data (i.e., the entire landscape). Like class metrics, these may be integrated by a simple or weighted averaging, or may reflect aggregate properties of the patch mosaic. In many applications, the primary interest is in the pattern (i.e., composition and configuration) of the entire landscape mosaic. Spatial configuration [of a grid map] is much more difficult to quantify and refers to the spatial character and arrangement, position, or orientation of patches within the class or landscape. Some aspects of configuration, such as patch isolation or patch contagion, are measures of the placement of patch types relative to other patches, other patch types, or other features of interest. Other aspects of configuration, such as shape (see also, Section 4.2.8) and core area, are measures of the spatial character of the patches. There are many aspects of configuration and the literature is replete with methods and indices developed for representing them. Configuration can be quantified in terms of the landscape unit itself (i.e., the patch). The spatial pattern being represented is the spatial character of the individual patches, even though the aggregation is across patches at the class or landscape level. The location of patches relative to each other is not explicitly represented. Metrics quantified in terms of the individual patches (e.g., mean patch size and shape) are spatially explicit at the level of the individual patch, not the class or landscape. Such metrics represent recognition that the ecological properties of a patch are influenced by the surrounding neighborhood (e.g., edge effects) and that the magnitude of these influences is affected by patch size and shape. These metrics simply quantify, for the class or landscape as a whole, some attribute of the statistical distribution (e.g., mean, max, variance) of the corresponding patch characteristic (e.g., size, shape). Indeed, any patch-level metric can be summarized in this manner at the class and landscape levels. Configuration also can be quantified in terms of the spatial relationship of patches and patch types (e.g., nearest-neighbor, contagion). These metrics are spatially explicit at the class or landscape level because the relative location of individual patches within the patch mosaic is represented in some way. Such metrics represent recognition that ecological processes and organisms are affected by the overall configuration of patches and patch types within the broader patch mosaic. A number of configuration metrics can be formulated either in terms of the individual patches or in terms of the whole class or landscape, depending on the emphasis sought. For example, perimeter-area fractal dimension is a measure of shape complexity (Mandelbrot 1982, Burrough 1986, Milne 1991) that can be computed for each patch and then averaged for the class or landscape, or it can be computed from the class or landscape as a whole by regressing the logarithm of patch perimeter on the logarithm of patch area. Similarly, core area can be computed for each patch and then represented as mean patch core area for the class or landscape, or it can be computed simply as total core area in the class or landscape. Obviously, one form can be derived from the other if the number of patches is known and so they are largely redundant; the choice of formulations is dependent upon user preference or the emphasis (patch or class/landscape) sought. The same is true for a number of other common landscape metrics. Typically, these metrics are spatially explicit at the patch level, not at the class or landscape level. Patch size distribution and density: The simplest measure of configuration is patch size, which represents a fundamental attribute of the spatial character of a patch. Most landscape metrics either directly incorporate patch size information or are affected by patch size. Patch size distribution can be summarized at the class and landscape levels in a variety of ways (e.g., mean, median, max, variance, etc. ), or, alternatively, represented as patch density, which is simply the number of patches per unit area. Patch shape complexity: Shape complexity relates to the geometry of patches--whether they tend to be simple and compact, or irregular and convoluted. Shape is an extremely difficult spatial attribute to capture in a metric because of the infinite number of possible patch shapes. Hence, shape metrics generally index overall shape complexity rather than attempt to assign a value to each unique shape. The most common measures of shape complexity are based on the relative amount of perimeter per unit area, usually indexed in terms of a perimeter-to-area ratio, or as a fractal dimension, and often standardized to a simple Euclidean shape (e.g., circle or square). The interpretation varies among the various shape metrics, but in general, higher values mean greater shape complexity or greater departure from simple Euclidean geometry. Other methods have been proposed: radius of gyration (Pickover 1990); contiguity (LaGro 1991); linearity index (Gustafson and Parker 1992); and elongation and deformity indices (Baskent and Jordan 1995), but these have not yet become widely used (Gustafson 1998). Core Area: Core area represents the interior area of patches after a user-specified edge buffer is eliminated. The core area is the area unaffected by the edges of the patch. This “edge effect” distance is defined by the user to be relevant to the phenomenon under consideration and can either be treated as fixed or adjusted for each unique edge type. Core area integrates patch size, shape, and edge effect distance into a single measure. All other things equal, smaller patches with greater shape complexity have less core area. Most of the metrics associated with size distribution (e.g., mean patch size and variability) can be formulated in terms of core area. Isolation/Proximity: Isolation or proximity refers to the tendency for patches to be relatively isolated in space (i.e., distant) from other patches of the same or similar (ecologically friendly) class. Because the notion of “isolation” is vague, there are many possible measures depending on how distance is defined and how patches of the same class and those of other classes are treated. If dij is the nearest-neighbor distance from patch i to another patch j of the same type, then the average isolation of patches can be summarized simply as the mean nearest-neighbor distance over all patches. Alternatively, isolation can be formulated in terms of both the size and proximity of neighboring patches within a local neighborhood around each patch using the isolation index of Whitcomb et al. (1981) or proximity index of Gustafson and Parker (1992), where the neighborhood size is specified by the user and presumably scaled to the ecological process under consideration. The original proximity index was formulated to consider only patches of the same class within the specified neighborhood. This binary representation of the landscape reflects an island biogeographic perspective on landscape pattern. Alternatively, this metric can be formulated to consider the contributions of all patch types to the isolation of the focal patch, reflecting a landscape mosaic perspective on landscape patterns. Contrast: Contrast refers to the relative difference among patch types. For example, mature forest next to younger forest might have a lower-contrast edge than mature forest adjacent to open field, depending on how the notion of contrast is defined. This can be computed as a contrast-weighted edge density, where each type of edge (i.e., between each pair of patch types) is assigned a contrast weight. Alternatively, this can be computed as a neighborhood contrast index, where the mean contrast between the focal patch and all patches within a user-specified neighborhood is computed based on assigned contrast weights. Relative to the focal patch, if patch types with high contrast lead to greater isolation of the focal patch, as is often the case, then contrast will be inversely related to isolation (at least for those isolation measures that consider all patch types). Dispersion: Dispersion refers to the tendency for patches to be regularly or contagiously distributed (i.e., clumped) with respect to each other. There are many dispersion indices developed for the assessment of spatial point patterns, some of which have been applied to categorical maps. A common approach is based on nearest-neighbor distances between patches of the same type. Often this is computed in terms of the relative variability in nearest-neighbor distances among patches; for example, based on the ratio of the variance to mean nearest-neighbor distance. Here, if the variance is greater than the mean, then the patches are more clumped in distribution than random, and if the variance is less than the mean, then the patches are more uniformly distributed. This index can be averaged over all patch types to yield an average index of dispersion for the landscape. [Guide editors note: this class of measure is not recommended as it is dimensionally inconsistent — V/M ratios are appropriate for count-based or quadrat data but not for distance–based measures]. Alternative indices of dispersion based on nearest-neighbor distances can be computed, such as the familiar Clark and Evans (1954) index. Contagion and Interspersion: Contagion refers to the tendency of patch types to be spatially aggregated; that is, to occur in large, aggregated or “contagious” distributions. Contagion ignores patches per se and measures the extent to which cells of similar class are aggregated. Interspersion, on the other hand, refers to the intermixing of patches of different types and is based entirely on patch (as opposed to cell) adjacencies. There are several different approaches for measuring contagion and interspersion. One popular index that subsumes both dispersion and interspersion is the contagion index based on the probability of finding a cell of type i next to a cell of type j (Li and Reynolds 1993). This index increases in value as a landscape is dominated by a few large (i.e., contiguous) patches and decreases in value with increasing subdivision and interspersion of patch types. This index summarizes the aggregation of all classes and thereby provides a measure of overall clumpiness of the landscape. McGarigal and Marks (1995) suggest a complementary interspersion/juxtaposition index that increases in value as patches tend to be more evenly interspersed in a "salt and pepper" mixture. These and other metrics are generated from the matrix of pairwise adjacencies between all patch types, where the elements of the matrix are the proportions of edges in each pairwise type. There are alternative methods for calculating class-specific contagion using fractal geometry (Gardner and O’Neill 1991). Lacunarity is an especially promising method borrowed from fractal geometry by which contagion can be characterized across a range of spatial scales (Plotnick et al. 1993 and 1996, Dale 2000). The technique involves using a moving window and is concerned with the frequency with which one encounters the focal class in a window of different sizes. A log-log plot of lacunarity against window size expresses the contagion of the map, or its tendency to aggregate into discrete patches, across a range of spatial scales. Subdivision: Subdivision refers to the degree to which a patch type is broken up (i.e., subdivided) into separate patches (i.e., fragments), not the size (per se), shape, relative location, or spatial arrangement of those patches. Because these latter attributes are usually affected by subdivision, it is difficult to isolate subdivision as an independent component. Subdivision can be evaluated using a variety of metrics already discussed; for example, the number, density, and average size of patches and the degree of contagion all indirectly evaluate subdivision. However, a suite of metrics derived from the cumulative distribution of patch sizes provide alternative and more explicit measures of subdivision (Jaeger 2000). When applied at the class level, these metrics can be used to measure the degree of fragmentation of the focal patch type. Applied at the landscape level, these metrics connote the graininess of the landscape; i.e., the tendency of the landscape to exhibit a fine- versus coarse-grain texture. A fine-grain landscape is characterized by many small patches (highly subdivided); whereas, a coarse-grain landscape is characterized by fewer large patches. Connectivity: Connectivity generally refers to the functional connections among patches. What constitutes a "functional connection" between patches clearly depends on the application or process of interest; patches that are connected for bird dispersal might not be connected for salamanders, seed dispersal, fire spread, or hydrologic flow. Connections might be based on strict adjacency (touching), some threshold distance, some decreasing function of distance that reflects the probability of connection at a given distance, or a resistance-weighted distance function. Then various indices of overall connectedness can be derived based on the pairwise connections between patches. For example, one such index, connectance, can be defined on the number of functional joinings, where each pair of patches is either connected or not. Alternatively, from percolation theory, connectedness can be inferred from patch density or be given as a binary response, indicating whether or not a spanning cluster or percolating cluster exists; i.e., a connection of patches of the same class that spans across the entire landscape (Gardner et al., 1987). Connectedness can also be defined in terms of correlation length for a raster map comprised of patches defined as clusters of connected cells. Correlation length is based on the average extensiveness of connected cells. A map's correlation length is interpreted as the average distance one might traverse the map, on average, from a random starting point and moving in a random direction, i.e., it is the expected traversibility of the map (Keitt et al., 1997).